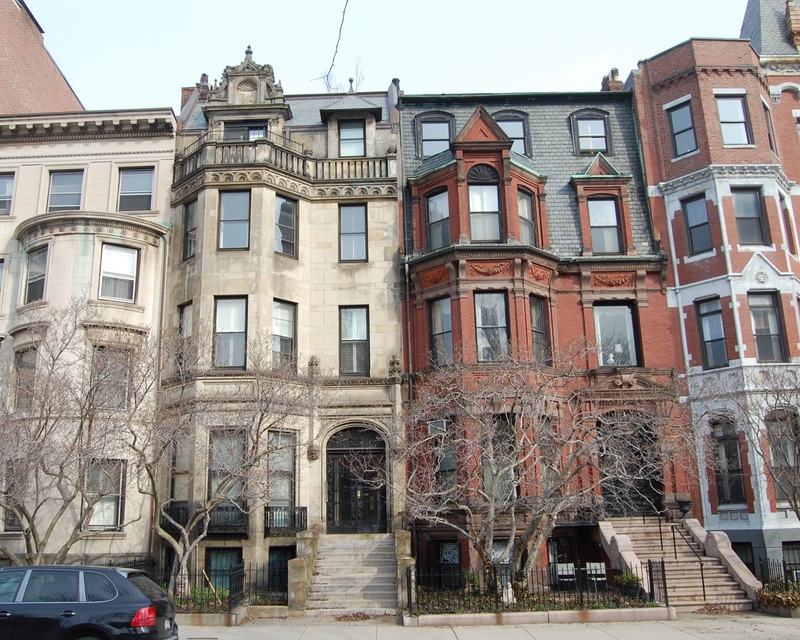 327 Commonwealth is located on the north side of Commonwealth, between Hereford and Massachusetts Avenue, with 325 Commonwealth to the east and 329 Commonwealth to the west. 327 Commonwealth was designed by Kirby and Lewis, architects, and built by James W. Tobey, builder, in 1880, for speculative sale. He is shown as the owner on the original building permit application, dated March 3, 1880. James Tobey purchased the land for 327 Commonwealth on November 26, 1879, from Fanny Pope (Hovey) Morse, the wife of attorney John Torrey Morse, Jr. The Morses lived at 9 Fairfield. The land was the eastern half of a lot Fanny Morse had acquired on February 20, 1879, from a real estate investment trust formed by Grenville Temple Winthrop Braman, Henry Dwight Hyde, and Frank William Andrews, part of one of four tracts of land they had purchased on March 1, 1872, from the Boston Water Power Company. 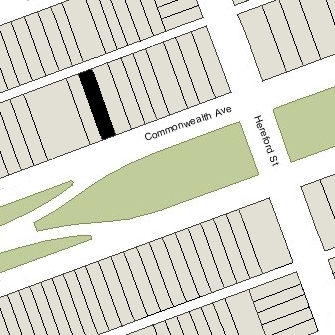 Click here for an index to the deeds for 327 Commonwealth, and click here for further information on the land on the north side of Commonwealth between Hereford and Massachusetts Avenue. On December 3, 1879, James Tobey entered into a party wall agreement with Fanny Morse governing the party wall he would build between 327 Commonwealth and 329 Commonwealth. The party wall stipulations relating to the eastern wall were set forth in the deed from Grenville Braman et al to Fanny Morse. On December 20, 1880, the land and “new dwelling house thereon” at 327 Commonwealth was purchased from James Tobey by the estate of Martin L. Hall, a wholesale grocer who had died in February of 1875. It became the home of his widow, Josephine S. (Goodwin) Hall. Their son, George Goodwin Hall, and her mother, Zilpha (Stetson) Goodwin, the widow of Joseph Goodwin, lived with her. They previously had lived in Brookline. Josephine Hall died in December of 1897, and Zilpha Goodwin died in April of 1898. George Hall continued to live at 327 Commonwealth. His great-aunt, Sarah Maria Stetson, lived with him (and may have lived with his mother and grandmother before their deaths). George Hall married in March of 1906 to Martha D. Mathews, a dressmaker. Miss Stetson moved at about that time to Brookline. George and Martha Hall continued to live at 327 Commonwealth during the 1906-1907 winter season, but moved soon thereafter. On February 18, 1907, 327 Commonwealth was purchased from the estate of Martin Hall by Herbert Dumaresq. He and his wife, Frederika (Slade) Dumaresq, made it their home. In 1906, they had lived at 107 Beacon. They also maintained a home, Kona Farm, in Moultonborough, New Hampshire. Herbert Dumaresq was a former cotton manufacturer and partner in Jordan, Marsh & Company, retail dry goods merchants and department store operators (his first wife, from whom he was divorced, had been Julia Maria Jordan, daughter of Eben Dyer Jordan). On March 20, 1913, Herbert Dumaresq transferred 327 Beacon into Frederika Dumaresq’s name. The Dumaresqs continued to live at 327 Commonwealth until about 1927, after which they made their home in Moultonborough. On January 7, 1927, 327 Commonwealth was purchased from Frederika Dumaresq by investment broker Frederick Strong Moseley. He and his wife, Helen (Carpenter) Moseley, lived at 144 Beacon. 327 Commonwealth became the home of their son and daughter-in-law, Benjamin Perley Poore Moseley and Elizabeth Whitwell (Thomas) Moseley. They previously had lived in Ipswich, where they continued to maintain a home. He was a note and investment broker in his father’s firm. 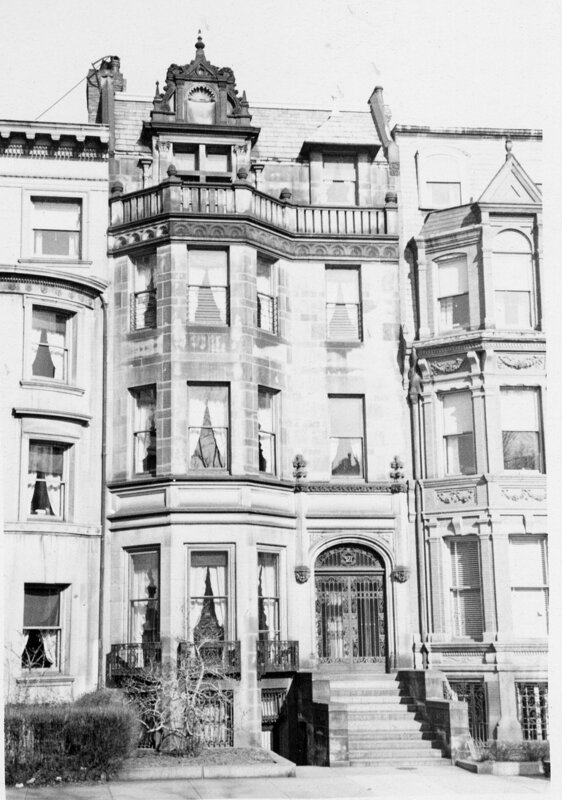 The front façade of 327 Commonwealth was significantly remodeled sometime between the late 1890s and the early 1940s. This probably occurred either when the Dumaresqs bought the house in 1907 or when the Moseley family acquired it in 1927. On December 1, 1933, Frederick Moseley transferred 327 Commonwealth to a trust for the benefit of Benjamin Moseley and his heirs, with himself, Robert Homans, and Benjamin Moseley as trustees. Robert Homans died in April of 1934 and Frederick Moseley died in June of 1938, and the Boston Safe Deposit and Trust Company was named as successor trustee in their place. On December 27, 1938, the Boston Safe Deposit and Trust Company and Benjamin P. P. Moseley, trustees, transferred 327 Commonwealth to real estate dealer and conveyancer Henry C. Brookings (with the deed indicating that Mr. Moseley was “correctly known as Ben P. P. Moseley”). Henry Brookings entered into a mortgage on the property with the trust and transferred the property (with the mortgage) to Ben P. P. Moseley. The Moseleys continued to live at 327 Commonwealth until about 1952, when they moved to 144 Beacon, which had remained his mother’s home until her death in October of 1952. 327 Commonwealth was shown as vacant in the 1953 City Directory. 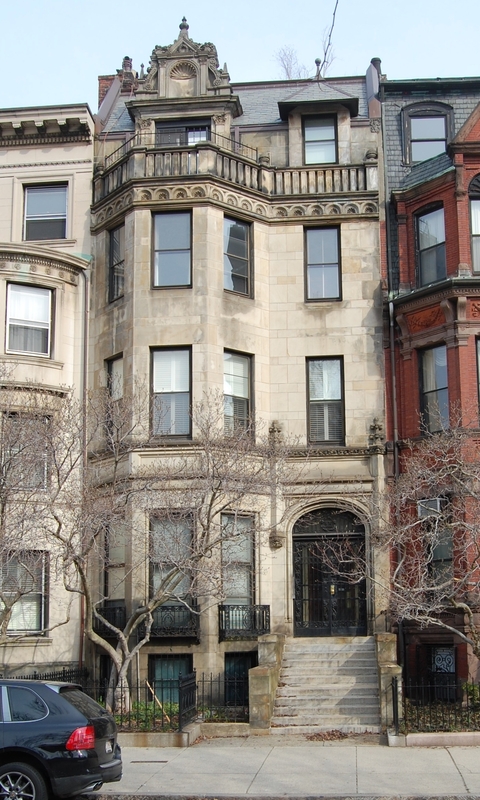 In 1953, the Boston Music School investigated acquiring the property but subsequently decided not to purchase it. On September 30, 1953, 327 Commonwealth was purchased from Ben P. P. Moseley and the trust by the Weston Construction Company. On December 23, 1953, 327 Commonwealth was acquired from the Weston Construction Company by the National Realty Company, Inc. (Charles Talanian president and Thomas J. Diab treasurer). In March of 1954, National Realty applied for (and subsequently received) permission to convert the property from a single-family dwelling into nine apartments. On September 4, 1956, Dr, Eugene Y. Chen, a dentist, and his wife, Helen Chen, purchased 327 Commonwealth from National Realty. They lived in Somerville. On February 13, 1977, 327 Commonwealth was purchased from the Chens by Robert E. Morris, and on September 6, 1979, it was purchased from him by the 327 Commonwealth Avenue LLC (Robert L. Seidler, Jr., president). In February of 1980, Robert Seidler applied for (and subsequently received) permission to convert the property from nine into five apartments. 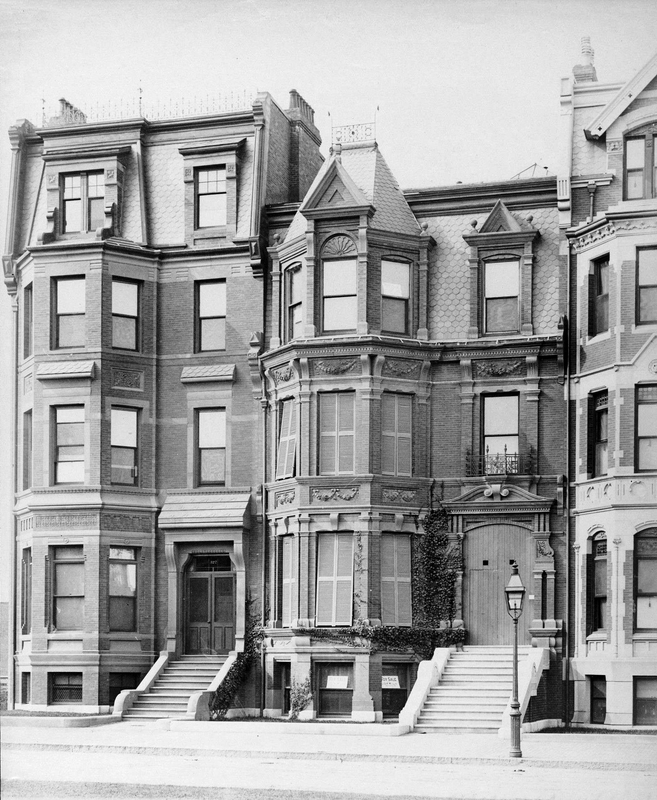 In June of 1981, 327 Commonwealth Avenue LLC converted the property into five condominium units, the 327 Commonwealth Avenue Condominium.